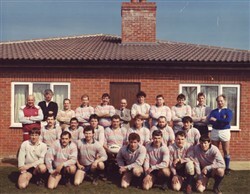 Three images: (1) The East Midlands Rugby Team line-up for the opening match celebrating the opening of the Olney RUFC clubhouse in 1988, no players names. 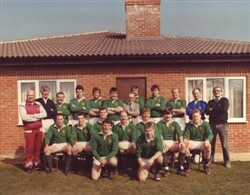 (2) Olney Rugby Team line-up for the opening match celebrating the opening of the Olney RUFC clubhouse in 1988, no players names. 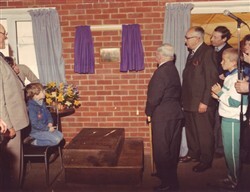 (3) The unveiling of the plaque at Olney’s new clubhouse on the 10th April 1988.